I have an obsession with outdoor door hangers, I’ll admit it. 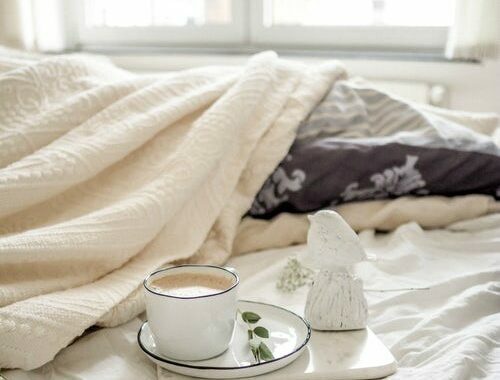 I find it’s a very simple and clean way to decorate your home. And since spring is here and the sun is finally shining I feel the need to add to my collection. 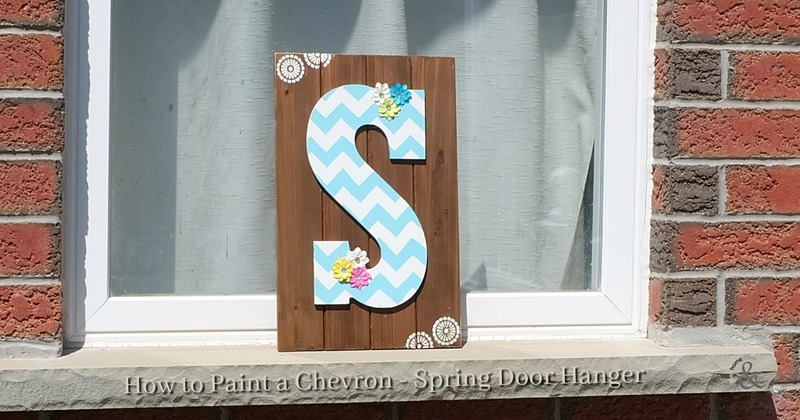 I love this chevron letter door hanger and I hope you do too. 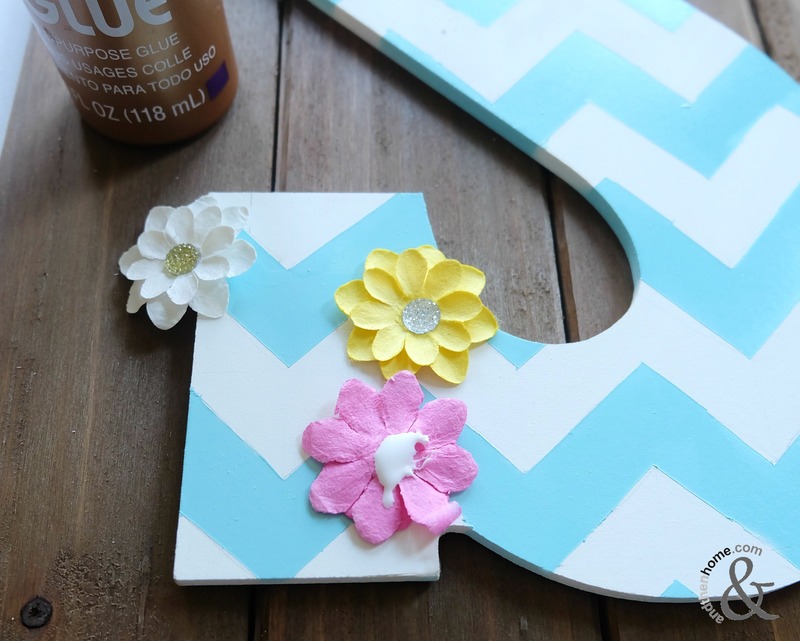 Read on to find out How to Paint a Chevron a Spring Door Hanger, do it yourself!! I have always wanted to use a chevron pattern in my decor and this was the perfect opportunity. 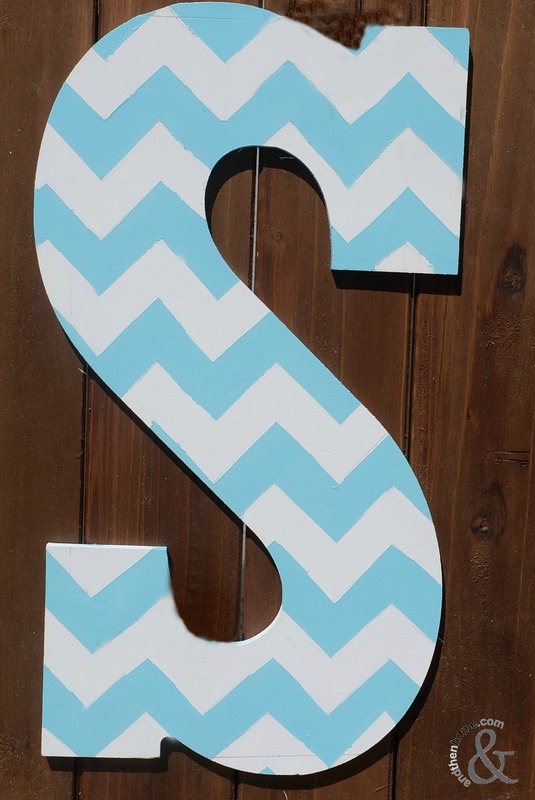 Although painting the chevron was a little challenging, the end result was beautiful. 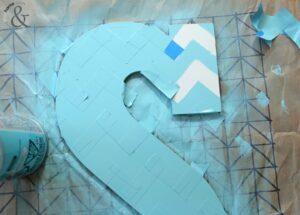 There is something satisfying about pulling the tape off the product and seeing the crisp lines of the chevron coming together. The other thing I love about this project was using bright spring colours against the dark stained wood. 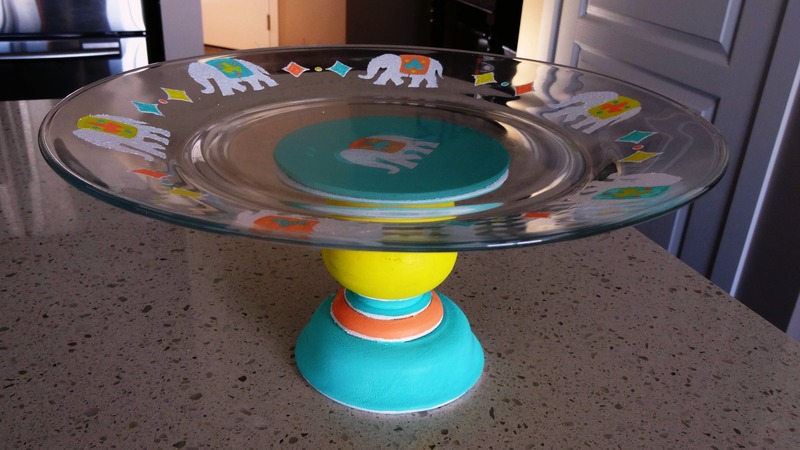 Teal is one of my favourite colours so it wasn’t difficult for me to choose it. 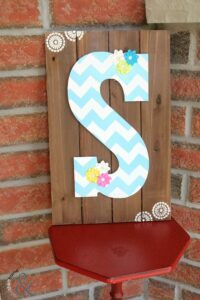 The white stamps are beautifully contrasted with the dark wood and the flower accents help represent spring tying the letter “S” in nicely. 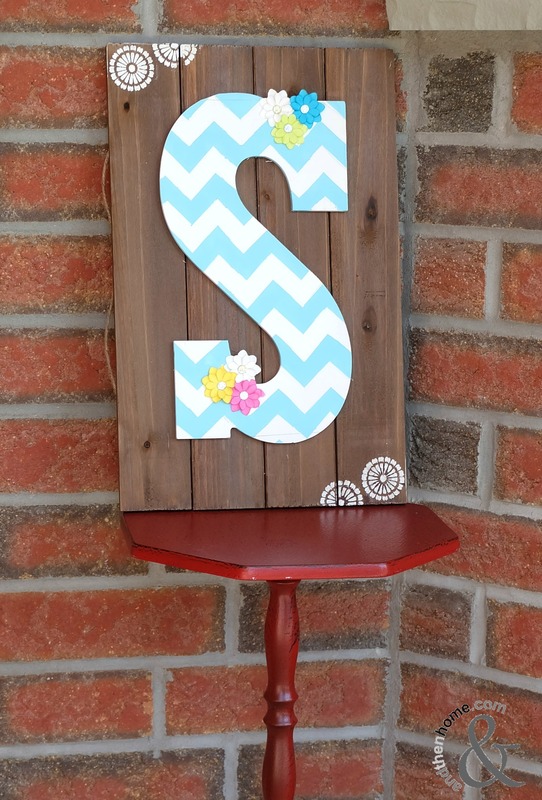 I chose the letter “S” because it is a monogram of my last name and conveniently works for the word Spring but you can pick any letter you’d like. With that said, let’s take a look at the step by step. 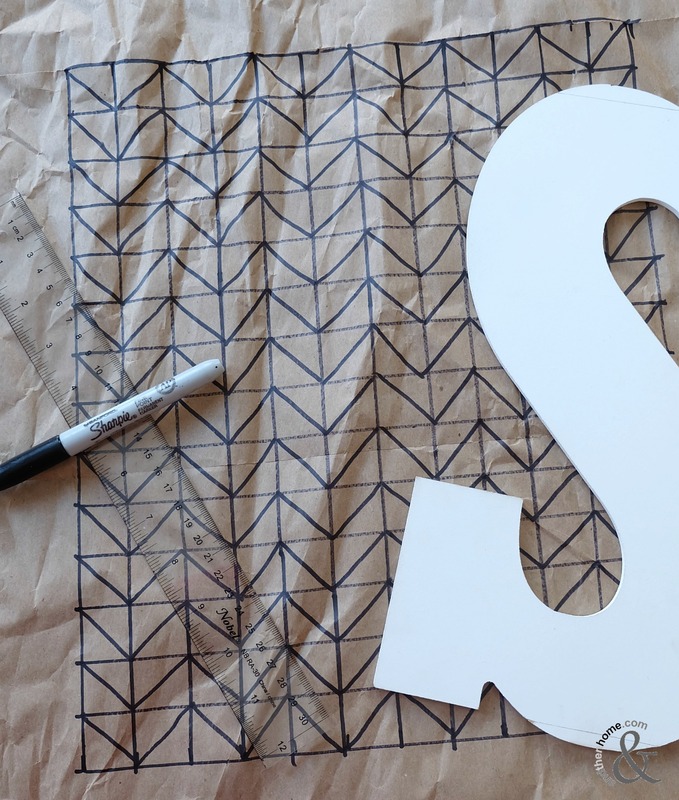 The first step is to set up the chevron grid. 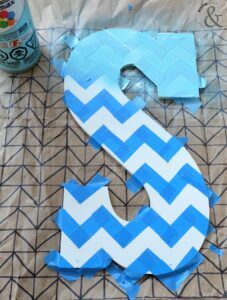 Completing the chevron will be the most tedious part of the project. Begin the grid by measuring and marking a rectangle that is slightly larger then your letter. 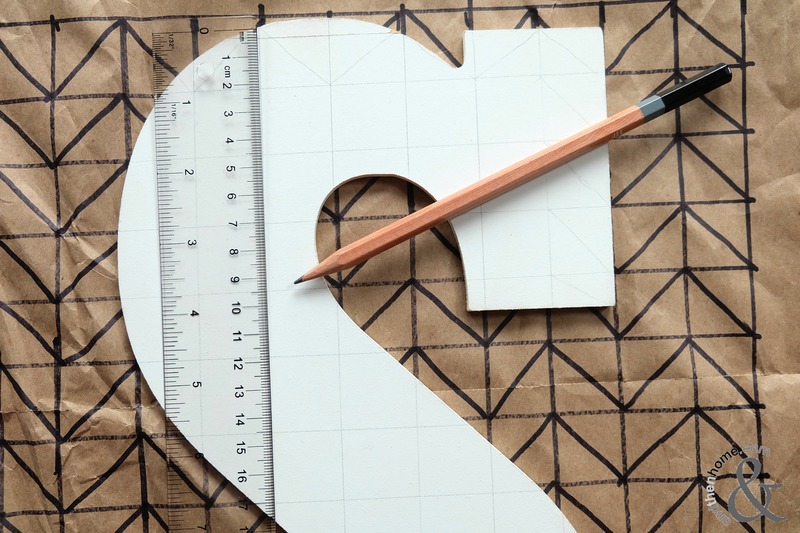 Next is to create a grid within the rectangle, measure and mark even squares throughout the whole box. 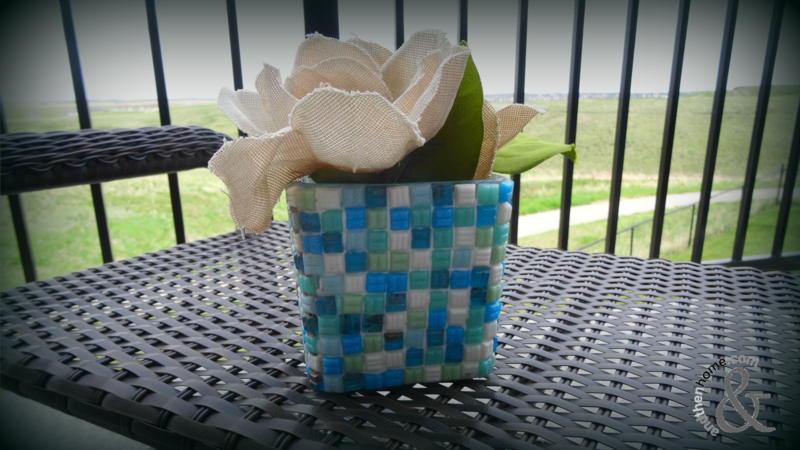 My squares are 2″ by 2″, which created a nice chevron. Once the grid has been drawn you need to create the chevron pattern. Do this by drawing a diagonal line from the top left corner to the bottom right hand corner of one 2 ” x 2″ square. In the next square draw a line from the bottom left corner to the top right. Repeat this method until all the squares have a diagonal line. 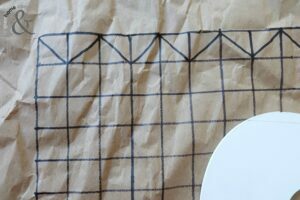 Place your letter in the grid, using a ruler and a pencil recreate the grid and diagonal lines onto the letter. Don’t press too hard on with your pencil as you will need to erase these lines later. 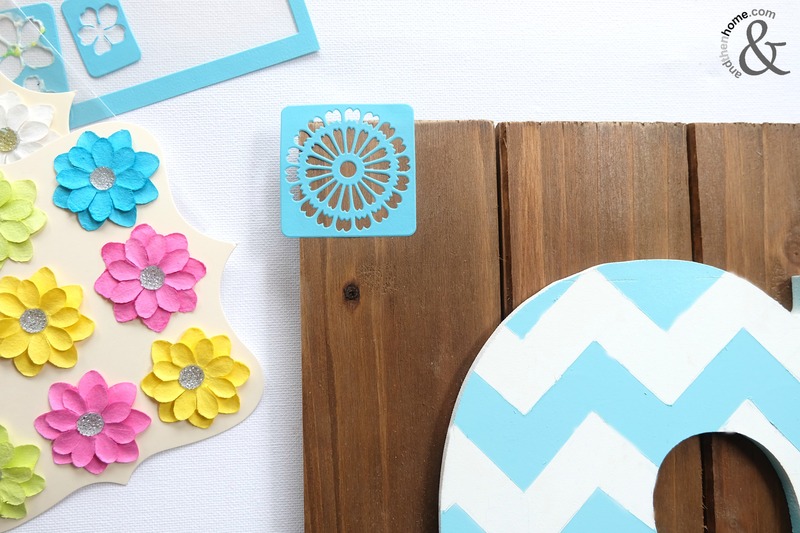 Add the tape to your letter. 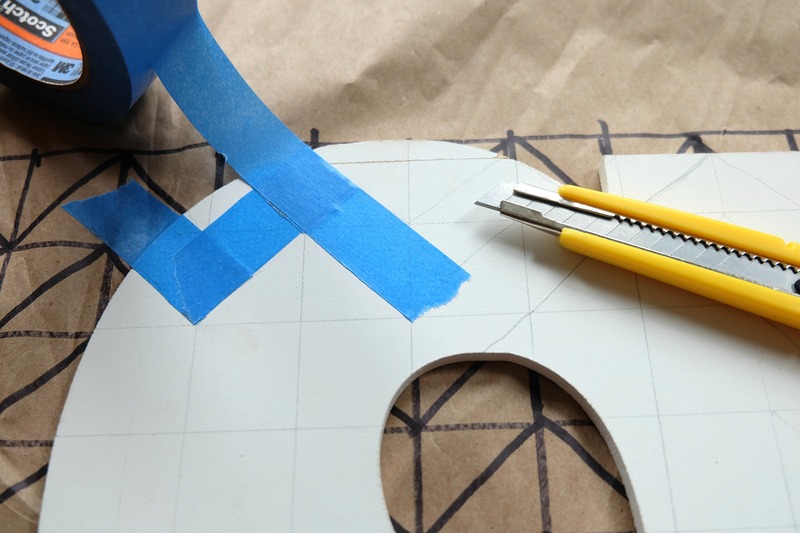 Place the tape in a diagonal pattern, using your grid as a guideline. 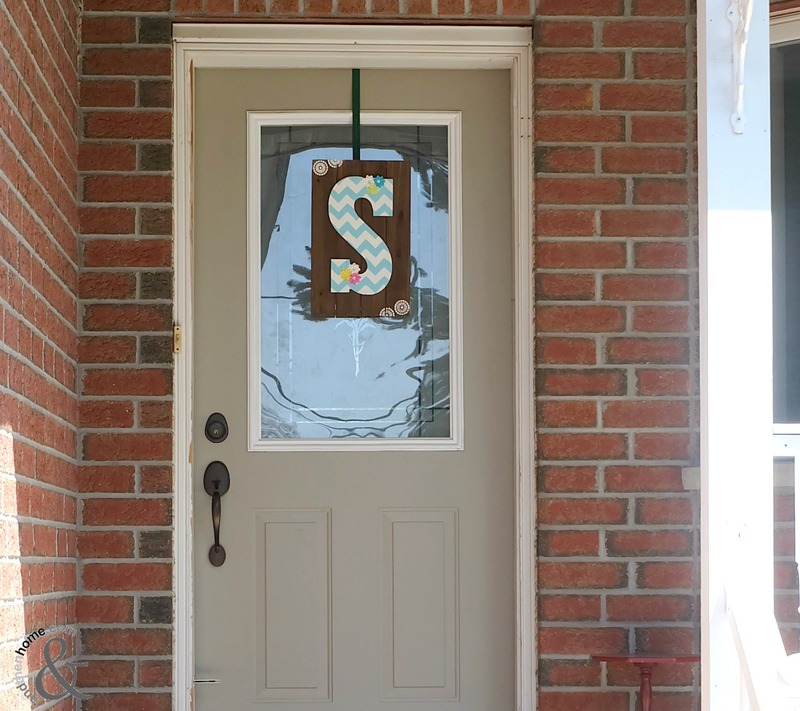 Be sure the tape is straight and secure. 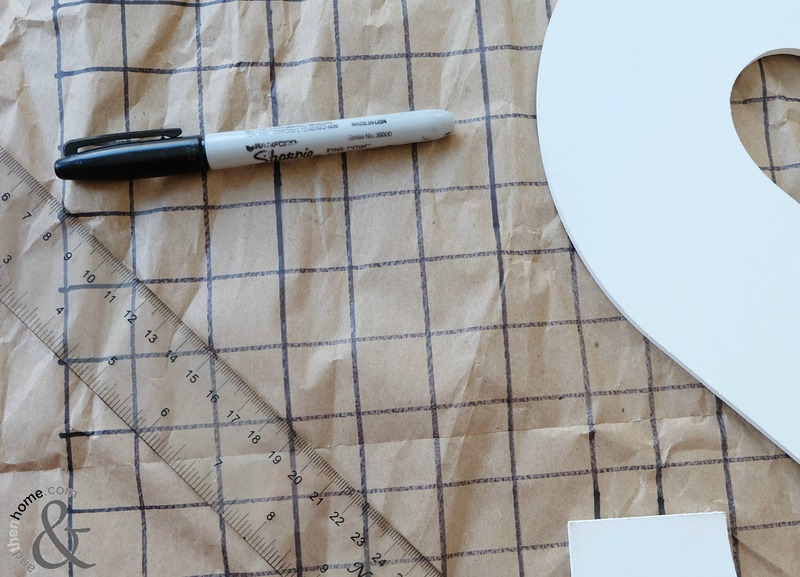 Use a sharp utility knife to make crisp lines and points where needed. 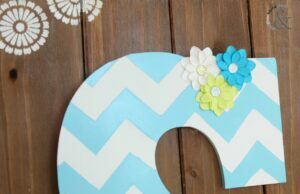 You should begin to see your chevron pattern. 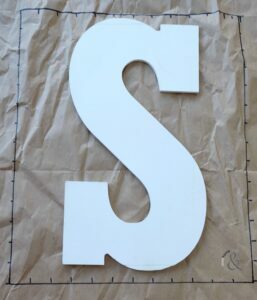 Once the tape has been placed you can spray paint the letter. Two coats may be needed, allow the letter to dry completely between each coat and once fully painted. When the paint has dried, you can pull the tape off carefully to reveal your pattern. Ta-Da!! The chevron is complete! Use your eraser to remove any visual pencil marks. Glue your letter to the wood plank (if you aren’t sure which one to use, check out our handy Glue Guide). Set aside until completely dry. Time for the embellishments! 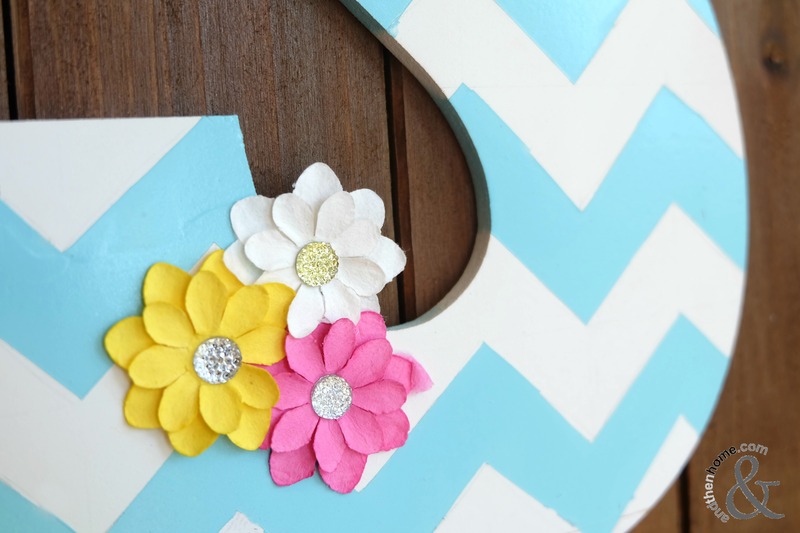 Glue your flowers, glitter, rhinestones or bows onto your letter. I used a stencil with white paint on the corners of my wood plank to give it more character. This project is beautiful once finished. You can see it from the road and I have had a lot of great comments about it. The chevron is stunning on the letter and worth all the hard work. 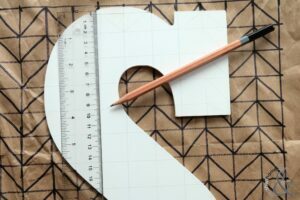 If you have a creative eye you can always ‘eyeball’ the design and go straight to the tape, but if you want to be sure it’s straight, do it the long way!